Breezy HR is an up-to-date, perfected HR manager for small, medium, and large businesses. Often described as the ‘miracle of intuitiveness’, Breezy collected all the best practices in hiring and HR management, and delivered a system where you can make the most of collaborative recruiting, and streamline employee management to an extent you never believed was possible. On top of that, Breezy HR is well-integrated and easy to use, and it will thereof blend in your software infrastructure regardless of how it looks. The integrations are the source of impeccable effectiveness, alongside numerous valuable features, some of which cannot be found in any similar HR system. What is really catchy about Breezy HR is how it balances between professionalism and price – small and medium businesses make use of all essential features at a moderately fixed price, while their larger counterparts make use of a quote-based enterprise pricing. It is because the company genuinely cares about delivering the functionality you need, on a price that you can afford. Our expert team examined closely each of the below-mentioned features Breezy can offer, and concluded there is a long list of benefits for buyers to consider when it comes to this system. Before everything else. Breezy is a modern and very intuitive HR manager, which means your entire team will grab hands around it in a matter of few hours. When is the last time this happened with a new software system? Many companies don’t recall such moment! Breezy HR covers all HR needs, from advertising open positions to streamlining employee communication, and does so with minimal human intervention. It is connected to AngelList and LinkedIn from where it sources talented candidates, and invites them to the system with a one-click Google Chrome Extension. Afterwards, clients are contacted in the same system, and interviewed in a video meeting to help you acquit their skills and personality. You also get to message them directly, and share files in all formats. Managing candidates and employees is indeed a breeze, thanks to the system’s powerful drag-and-drop pipeline. Adding new candidates is also simplified using the calendar integrations and resume parsing for skipping long and boring forms. Breezy is also ideal because it allows you to post openings on all premium job boards, use scoreboards to measure performance and evaluate candidates, and mostly because it is a mobile-friendly system that keeps teams connected regardless of their location. Recently added were new job sites like SEEK and Google jobs to Breezy’s single-click simple job posting, and integrated background checks that customers can run right from the recruiting workflow. What Problems Will Breezy HR Solve? Breezy lets them easily add team members, hiring managers, and external recruiters and assign job openings to them under one umbrella. It’s great to have a manager 3000 miles away be able to manage their candidates on their own with ease. Oh, and no need to be briefed by HR – the drag-and-drop pipelines give a beautiful, user-friendly birds-eye-view into the process for anyone who needs to enter, with close to zero learning curve. They want to respond in a timely manner and move candidates through the pipelines at an unprecedented rate, so they can hit unprecedented hiring goals. With customizable templates, automated stage actions, bulk and individual emailing, in-app scheduling and both live and one-way video interviews (also in-app) Breezy streamlines the whole process – everything is finally (finally!) all in one delightful space. Oh, and of course they want to get great feedback from applicants who felt the interview process had gone quickly and smoothly – Breezy sets every recruiter up for success with intuitive communication tools and simple integration with the stuff you’re already using (think Slack, Gmail, Outlook, Bamboo HR and Zapier). They need hiring managers and teammates’ buy-in so that everyone feels comfortable leaving a comment or rating a candidate’s custom scorecard. In Breezy, it’s as easy as an @-mention, and as intuitive as your favorite social app. 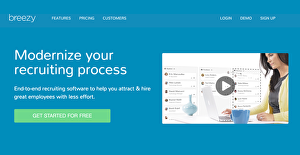 Techy people call the service the ‘Trello for hiring” echoing the popular to-do app, and it’s true! Breezy relies on the tried-and-true Kanban-style board system to get you through your work quickly, efficiently, and with real, measurable organization. Breezy’s development team believes the successful future of hiring will be based on transparency and team feedback, and it therefore designed a product that can make everyone feel comfortable and welcome the moment they start using it – whether they’re a designer, a programmer, a marketer, a salesperson, a CEO, an operations guru … you get the idea). If you are considering Breezy HR it might also be a good idea to investigate other subcategories of Best Applicant Tracking Software listed in our database of B2B software reviews. Organizations have unique wants and requirements and no software solution can be perfect in such a condition. It is pointless to try to find an ideal off-the-shelf software app that meets all your business needs. The wise thing to do would be to modify the solution for your specific needs, staff member skill levels, finances, and other elements. For these reasons, do not rush and pay for well-publicized popular systems. Though these may be widely used, they may not be the best fit for your particular requirements. Do your groundwork, investigate each short-listed application in detail, read a few Breezy HR reviews, speak to the seller for clarifications, and finally select the product that provides what you want. How Much Does Breezy HR Cost? We realize that when you make a decision to buy HR Software it’s important not only to see how experts evaluate it in their reviews, but also to find out if the real people and companies that buy it are actually satisfied with the product. That’s why we’ve created our behavior-based Customer Satisfaction Algorithm™ that gathers customer reviews, comments and Breezy HR reviews across a wide range of social media sites. The data is then presented in an easy to digest form showing how many people had positive and negative experience with Breezy HR. With that information at hand you should be equipped to make an informed buying decision that you won’t regret. What are Breezy HR pricing details? What integrations are available for Breezy HR? Pros: Breezy HR provides a quick and easy posting of job ads to multiple sites. At the same time, it has kept its rates low compared to other providers who continuously raise their prices. Cons: I can't figure out how to turn off email notifications for all users. Also, the messaging system is hard to keep organized. I'd like it to be easy for me to see new messages. Pros: Breezy HR is fairly straightforward, inexpensive, and easy to use. I like that they have the ability to add scorecards to each job and screening questions. I also like the ability to add candidates and parse profiles in the system based on Linked In profiles and resumes. Cons: It often freezes up when I'm trying to go through the resume. I also dislike the many notifications. I wish there was a way to filter search through keywords within the resumes or profiles of applicants. It doesn't also seem to integrate very well with outside job sites like The Muse, but it's a new system so I will give it time to grow. If you need more information about Breezy HR or you simply have a question let us know what you need and we’ll forward your request directly to the vendor.